Photo of Derek C Lachhanhima holding a chicken in one hand and a 10 rupee note in other hand had gone viral on social media earlier this week. The six-year-old boy from Mizoram had mistakenly run over his neighbour's chicken injuring it. Worried for the animal, Derek decided to rush it to a nearby hospital. After someone shared Derek's photo narrating the incident, social media users couldn't stop talking about the child's innocence. The photo in which Derek looks anxious was massively shared on social media making him an internet sensation. And as his photo continues to be shared widely on social media with people praising the child's timely action, an artist from Kerala has painted the little boy highlighting his innocent face. Sunil Pookode painted a portrait of young Derek standing on a globe with the injured chicken in one hand and money in the other. Pookode posted the picture on Facebook with a caption in Malayalam "നീ വലിയവനാടാ... ഡെർക്കാ (You are great, Derek)" The post has since then gone viral and has collected over 3,300 likes and 1,500 shared on Facebook. 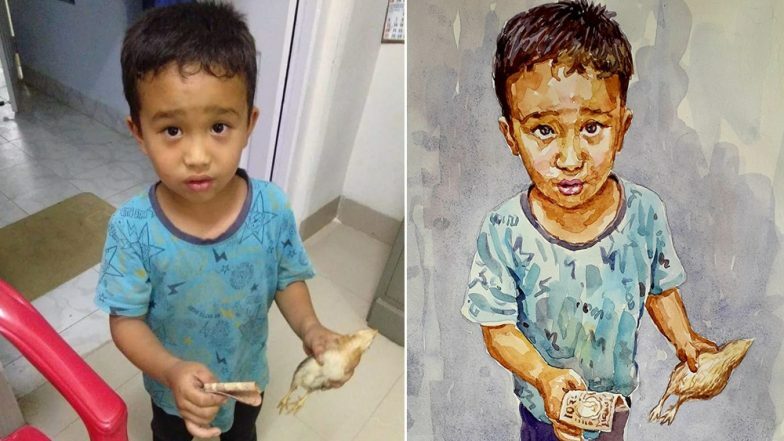 Mizoram Boy Mistakenly Ran Cycle Over Chicken and Took It to Hospital With All the Money He Had; His Viral Pic Will Melt Your Heart. As Derek's fame grew, his school St Pio, Sairang in Aizawl district awarded him for his generous act. The school authorities gave him a certificate of appreciation for setting an example of kindness. A photo of him holding the certificate and flowers along with a traditional shawl was also shared widely. We hope Derek's act inspires more people to be kind and empathetic towards people.